Leukerbad 3.9 million Litres of hot water! The Romans were among the first to recognise the healing properties of the hot springs of Leukerbad. This Valais thermal spa resort lies well protected in a side valley and is now a popular destination for wellness and winter sports’ enthusiasts. Leukerbad lies at 1,411m and has some great skiing up to 2,700m. Its other main party trick is the fact it has more than 30 Thermal baths to help soothe the aches and pains of a hard day on the slopes. Every day 3.9 million litres of hot water gush from the 65 thermal springs in the mountain spa resort of Leukerbad. These thermal springs have led to the development of tourism in Leukerbad and made it one of the biggest spa and wellness resorts in Switzerland. Apart from a medical rehabilitation centre, its attractions now include numerous public thermal baths. After their sporting activities, skiers cannot miss the chance to regenerate in the warm, relaxing water. The centre of Leukerbad is traffic-free and the Leukerbad Sports Arena offers plenty of indoor sports facilities to enjoy all-year round, whatever the weather. The baths consist of Jacuzzis, steam rooms, whirlpools and jets, and they all offer special events such as breakfast in the water, bathing at full moon and aqua fit exercises. These add a superb finishing touch to the fun, lively resort on offer. It all goes to show that swimming in Leukerbad is anything but boring. The village has a nice enclosed feeling, having steep mountain faces all around the boarder. Cars are allowed around the village however not into the main centre. This does not mean that the resort is over run by vehicles, as everything in the resort is within walking distance, therefore keeping it very quiet. The main high street is wide and has a few restaurants, baths and shops on it, it then curves and narrows and this is where a bit of the Swiss character returns. Little quaint coffee shops with seats at the front line the cobbled street. In Leukerbad and the surrounding area, you’ll find wide variety of culinary delights based in the regions 50 restaurants. These include everything from regional specialties to international dishes and haute cuisine. They taste all the better accompanied by a drop of the local Pfyfoltru wine, which is produced in Varen. 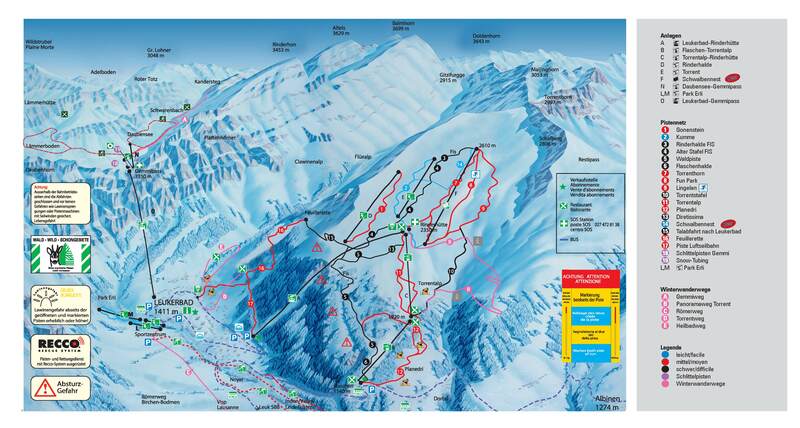 There are 2 areas to ski in Leukerbad, Alpine skiing on the Torrent and cross-country on the Gemmi Pass. Leukerbad offers about 50km of ski pistes, 25km of cross-country ski trails. The Gemmi cable car heads towards a steep cliff face and carries passengers up and over it to the Gemmiwand. This holds some amazing mountain secenery of the Gemmi region that is rich in tradition and holds the start point for Switzerland’s lar­gest and highest Via Ferrata climbing trail. The Torrent lift is where the main skiing takes place in Leukerbad. The pistes up there are very unique and offer panorama views and take you up to heights of 2,700m. We use one of the top Sports shops in Leukerbad, Relaction Sports, with excellent and well serviced equipment waiting for you – along with a 20% discount. Our prices are simple, LOW & HIGH season. We have Youth prices for up to 20yrs old, discounts for children up to the age of 16yrs and even bigger savings for Children under the age of 8yrs!